Eurisy publishes reports and analysis based on its work with end-user communities. The current report examines the main messages coming out of Eurisy's "Space4Ghent" conference on the uses of satellite imagery in cities, organised in cooperation with our members from BELSPO, in the framework of Apps for Ghent - an initiative aimed at maximising the potential of open data in Ghent through projects, events and co-creation. One hundred representatives from private companies, public managers and students attended the conference to discuss current and potential uses of Earth Observation in urban spaces. Participants were made aware of existing datasets, the Copernicus services in particular, as well as their possible applications at the city level. The event also discussed the obstacles hindering the exploitation of satellite data and put forward possible solutions to overcome them. The current report sums up Eurisy's conference "Satellite Applications for the Alps:Search and Rescue Edition" held on 11-12 October, 2017 in Brixen, Bressanone, Italy. Organised in cooperation with IDM SudTirol and the Satellite Navigation Cluster Berchtesgaden within the International Mountain Summit, a week-long international conference covering the global mountaineering community, the event was Eurisy's second conference covering the Alpine space. The current documents reflects on the day's discussions, as well as the observations made in a series of open-ended interviews with Alpine search and rescue organisations carried by Eurisy between the two events. The interviews covered more than 10 organisation from Italy, Austria, Switzerland, Slovenia and Germany and examine the use and challenges of satellite based services for emergency calls, mapping, team coordination and cross-border cooperation. Organised by our members at the Romanian Space Agency (ROSA) with the support of the European Space Agency (ESA) and the European Commission, the 6th edition of this regional gathering provided local and regional public and private organisations with information on the latest business opportunities created under the European Commission’s satellite programmes. Focusing on Eastern European stakeholders, the two day event covered topics emphasized the use of Earth Observation, satellite communication and satellite navigation technologies for socio-economic benefits and environmental management. At the centre of these benefits, local and regional confirmed and potential users presented their experience and needs during the Eurisy powered round table. The current document reflects on some of the take-aways of the conference and our round table discussion. What makes a city smart? For the private companies and local administrations participating in the Nordic Edge Expo last September, a smart city is a place where community needs, new technologies and innovation meet. An ecosystem of urban planners, IT and renewable energy companies, community development experts, universities, research clusters, and residents, pursuing the common goal of building the city of the future. Satellite applications have a role to play in the building of more sustainable, efficient and increasingly connected cities. This was the message of the speakers invited to attend the session organised by Eurisy during the three-day event. The session focusing on Satellite Applications for Infrastructure Management was organised under the Eurisy Space for Cities initiative, which aims to explore current and potential uses of satellite-based services to increase quality of life in cities. The current document details on speakers' interventions and exchanges, whilst putting forward recommendations for future questions to be explored. Confirmed and potential users of satellite based services covering health care and environment (e.g. telemedicine, air pollution), as well as experts, private sector representatives and policy makers belonging to both space and non-space communities, were invited to Belfast in June 2017 to discuss the potential of satellite applications in these sectors. On this occasion, attending delegates took the opportunity to share their experiences, lessons learned and exchange on how future technology-powered health and social care systems might look like. (Access the presentations here). The current document reflects on some of the lessons learned from the event, highlighting key points from the discussions that took place during the day. Potential and confirmed users of satellite applications (search and rescue organisations, national parks, geological offices and so on), as well as experts and policy makers, discussed the potential of satellite applications in the Alps, and what these could do for users in the environment, risk, and transport sectors. (Access the presentations here). This document reflects some of the lessons learnt from the Eurisy conference held in Berchtesgaden on 27 October 2016. These conclusions are drawn from the discussions that took place during the event. The 5th edition of Satellites Going Local collects testimonials from public and private organisations using satellite applications to improve their work and provide better services to the public. For the non-space professionals they are intended to demonstrate, in a down-to-earth manner, how digital products and services that rely on satellite navigation, satellite communications and Earth observation, benefit professionals in all areas of activity. Examples range from agriculture and environment, to risk management, to tourism and leisure, to infrastructure and building, to mobility and transport. To satellite professionals, they will offer insights into user needs, and possible business cases. This document analyses the 49 replies submitted to the Eurisy survey for public authorities by 49 Polish public administrations. The report was presented within the framework of a User Forum organised in Warsaw on the 19th of April 2016 by Eurisy, the Polish Ministry of Economic Development and the Polish Agency for Enterprise Development (PARP), with the support of the Polish Space Agency (POLSA) and the European Space Agency (ESA). The goal of the User Forum was to gather a qualitative feedback on survey replies that would help organisers in building a series of country-targeted recommendations, which are presented at the beginning of this report. 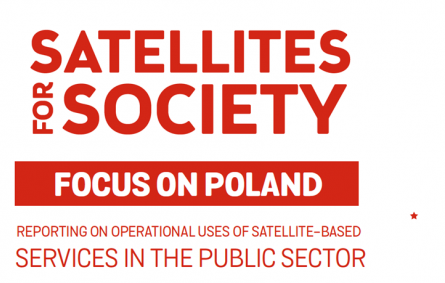 The new Eurisy publication “Satellites for Society: Reporting on operational uses of satellite-based services in the public sector” analyses more than 100 replies submitted to the Eurisy survey for public authorities in 2015. Public managers were asked why they started using satellite-based services, how much the services cost and how the uptake was financed, which challenges they face, and how the satellite solutions help them saving time and resources while improving the quality of public services. 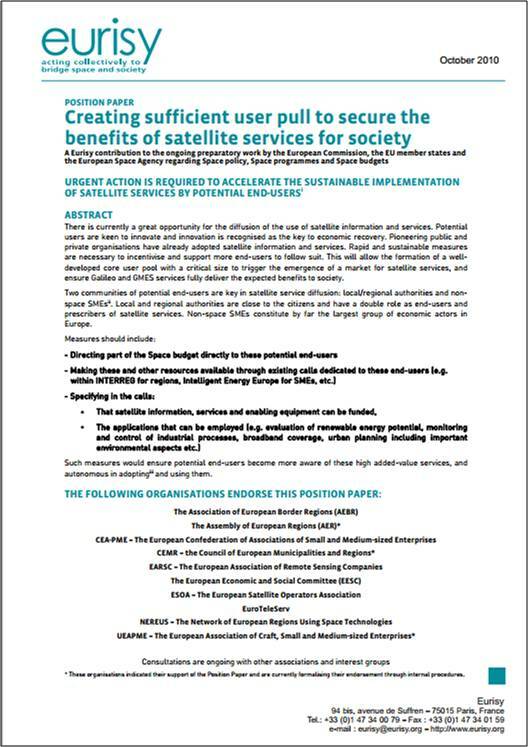 This publication is disseminated by Eurisy with the aim of contributing to building a knowledge base on the uses of satellite-based services in the public sector. By taking into account the direct feedback of public managers, the report offers a distinctive insight into the work of European public administrations, which will be useful to policy and decision-makers to increase the potential benefits of satellites for society. The Eurisy survey for public authorities remains open and accessible in nine languages at this LINK. Before launching its survey for public authorities, Eurisy submitted its questionnaire to ten public administrations using satellite applications operationally. The results of this work are presented in the analytical report “Operational uses of satellite-based applications in the public sector”, including a detailed description of the case studies reviewed. This document is the result of a consultation of stakeholders from the sports and leisure areas within the French county of Pyrénées-Atlantiques. This consultation took place as preliminary work for the "Outdoor Sports Surfing Avant-garde satellite solutions" conference co-organised by Eurisy, the local council of Pyrénées-Atlantiques and Capital High Tech. The discussions and conclusions of the conference also fed this document. The conference was to identify the innovation potential space can generate in the outdoor sports one of the main economic sectors in the county, especially through satellite applications targeted for this market. The conference also served as a catalyst for cooperation between the two, and between public and private actors from the area, from other countries, and from the European level (Access the presentations here). Islands can prove to be real labs for ICT-driven innovation. They are small and flexible. This means they can test ideas fast and implement only the best of them. Islands are confronted with specific needs – whether due to their remoteness, their vulnerability to climate change, or the scarcity of their resources. Such challenges call for creative solutions. The conference brought together 90 participants from Maltese and European public authorities, SMEs, universities and policy-makers. The event brought together SMEs, administrations and policy-makers from the Baltic States to discuss ways to increase the use of satellite resources in the region, in particular Copernicus and Galileo/EGNOS, the two satellite infrastructure programmes funded by the EU. The 2014 edition of Eurisy's "Satellites going local" publication collects operational examples in which satellite information and services have been used to provide new products and applications in the fields of media, education, arts and culture, leisure, tourism, marketing and sustainable urban development. Its main objective is to raise awareness of how public authorities and SMEs can use satellite applications to improve their services and engage people. Moreover, the publication is also intended to promote the “Digital Agenda for Europe”, the first of the seven Europe 2020 flagship initiatives, which aims to support citizens and businesses in getting the most out of digital technologies. The 3rd issue of “Satellites Going Local” presents operational examples of local and regional administrations and companies who use geospatial information, satellite navigation and satellite communications to improve water management locally, regionally and cross-border. It touches on sectors as diverse as water supply and management, agriculture, risk management, environmental protection and energy. Local and regional administrators and private companies who use or manage water sources can draw ideas and inspiration from these good practices so as to improve water management, and thus contribute to the sustainability of this vital resource on the long run. Geological and landscape diversity is an essential part of the European culture. It characterises our rural and urban environments and offers the resources needed to sustain human communities. To monitor and protect geological heritage, back in 2003 the European Parliament stressed the importance of harmonising analytical methods to obtain comparable soil data and of increasing the exchange of information among Member States on soil, topography, structure and natural form of the land in Europe (European Parliament, 2003). Today, satellites offer the opportunity to collect and access geological and biological information covering large areas, including urban, rural and natural environments at the micro and macro regional levels. On their own initiative, or within European and national schemes, local and regional managers are already using satellite services to monitor, protect and promote geological, landscape and biological diversity. To disseminate the results of these initiatives is fundamental to capitalise on experience to develop new services adapted to local needs, and to set the basis for the establishment of an integrated coherent system to manage geodiversity in Europe. Eurisy, a non-profit association of space agencies, works to foster awareness of operational uses of satellite applications in this and other sectors. 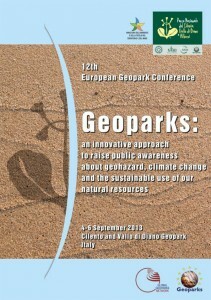 Paper presented at the 12th European Geoparks Conference, Cilento and Vallo di Diano Geopark, Italy, 4-6 September 2013. 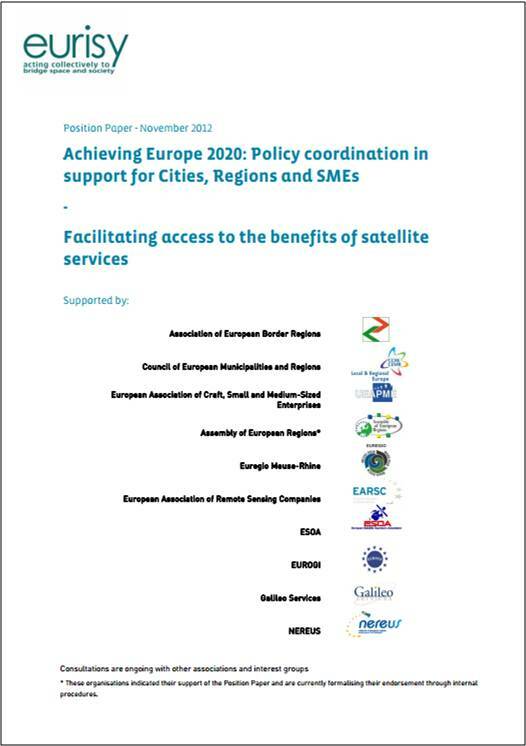 Eurisy’s Position Paper 2012 recommends that operational satellite solutions whose benefits are proven through end-users’ experience, and which help fulfil European policy obligations, should be referenced in European Directives and Regulations, as well as in European transversal funding schemes. Eurisy's Position Papers are published every two years. Their are based on Eurisy's grassroots with user communities. Their objective is to provide decision-makers with feedback on facilitating factors and obstacles to the take-up of operational applications by professional end-users from various sectors. Case study observations confirm that the merits of the technology alone, and a technology-driven approach does not necessarily convince the user to adopt this new technology. Similarly, top-down measures to stimulate take-up are not sufficient unless they are accompanied by grassroots support to the potential end-users in their appropriation of these tools. Such support should be based on a better understanding of their operational needs and the economic realities on the field. Cooperation between early adopters and potential end-users on a peer-to-peer level, relationships between potential end-users and technologists that are based on a real business case for service use as opposed to service development, as well as political drive on all levels, including sub-national, are all crucial factors in bringing about the kind of social change that translates an effective penetration of the satellite services within society. 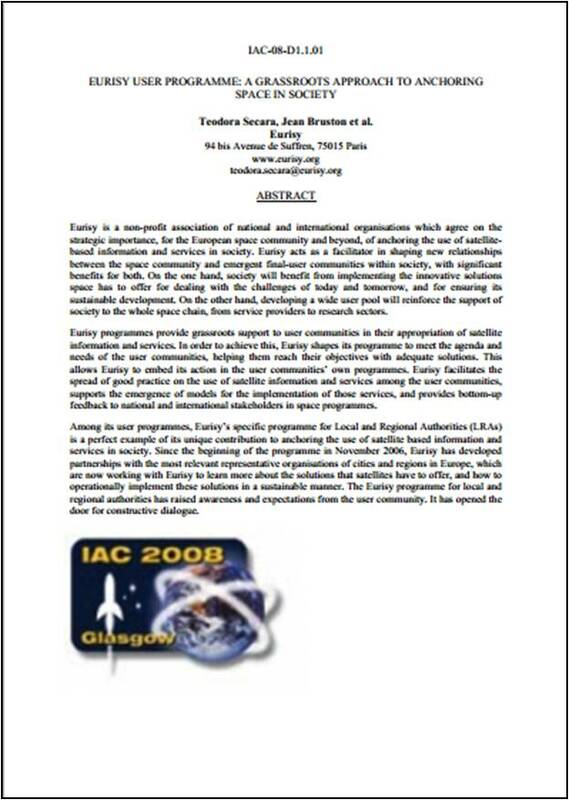 Paper presented at the International Astronautical Congress 2012. This paper presented at the 2012 Toulouse Space Show, France aims at underlining, through concrete examples, how European cities make the most of satellite information and services, and satellite navigation in particular, to achieve sustainable urban mobility and create viable alternatives to owning a private vehicle. Without being exhaustive, the operational examples described also show how the integration of satellite information and services in urban mobility strategies benefits other policy areas of increasing importance, like health and social inclusion. COAST ALIVE (CA!) is a project between several North Sea coastal regions concerned with promoting healthy living and mitigating climate change in coastal areas. Eurisy has worked with Norfolk County Council, one of the project partners, in producing a tailored report on the County needs and challenges, with experts' recommendations on using satellite applications to meet them. Norfolk is currently looking at how to include satellite data in their current geographical information system, following some of these recommendations. This report evaluates the added value of satellite broadband in achieving 100% broadband coverage of the territory of Hampshire County. It is the outcome of a Eurisy case-study workshop hosted by the Hampshire County Council in Winchester, early 2011. The event brought together stakeholders from Hampshire County Council and satellite broadband experts from the European Satellite Operators Association (ESOA). 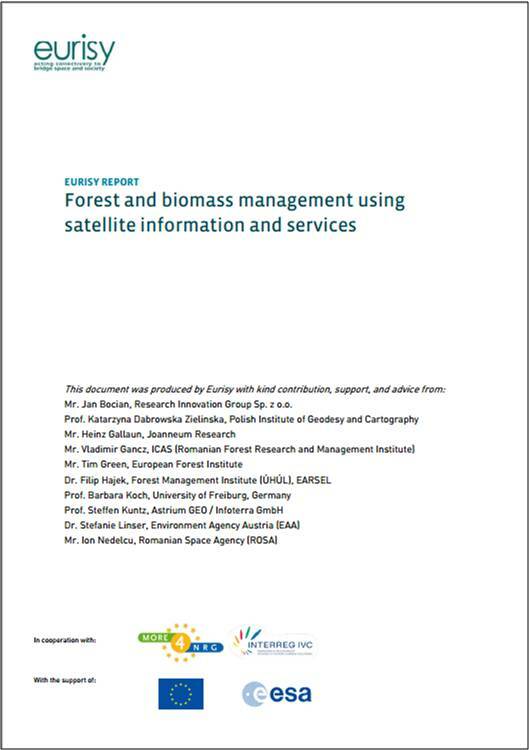 Eurisy, with the support of remote sensing and forestry experts, has produced an introduction highlighting the added value of satellite applications for forestry inventories and biomass assessments as part of sustainable energy strategies on a local and regional level. The report provides new ideas to local and regional authorities actively seeking to leverage innovation in their projects related to forestry and biomass. It includes recommendations for local and regional authorities considering such solutions. There is currently a great opportunity for the diffusion of the use of satellite information and services. Potential users are keen to innovate and innovation is recognised as the key to economic recovery. Pioneering public and private organisations have already adopted satellite information and services. Rapid and sustainable measures are necessary to incentivise and support more end-users to follow suit. This will allow the formation of a well-developed core user pool with a critical size to trigger the emergence of a market for satellite services, and ensure Galileo and GMES services fully deliver the expected benefits to society. Article published Space Policy Magazine, Vol. 25 Issue 4, November 2009. Go to Science Direct Website for Article. Copyright 2009 Published by Elsevier Ltd. All rights reserved. Satellite services benefit civil society by helping tackle challenges such as climate change, the digital divide, etc. They have the potential to deliver concrete benefits to European society through innovative services supporting economic, societal and environmental policies. However, this potential has yet to be achieved. The paper argues that technological bias, the diversity of interests and initiatives among stakeholders and their individual actions do not always serve their collective objective to ensure wide diffusion of satellite services. This Paper argues that it is necessary to make efficient use of public investment in research and development by supporting the transition of the results into the final operational service/product.Recommended measures include ensuring a better transition between the 7th Framework Programmes and European Regional Policy Funds, by designing calls that take into consideration the R&D stage but also the operational use of the resulting services as an objective in itself. Such calls would make it compulsory to include end-users from the R&D stage, and a business case for these to use the resulting services.